A very well built machine, the Star Trac TR901 treadmill offers everything you would expect from a Star Trac treadmill built for home. Since its price drop from last year, this treadmill can now be considered as one of the top treadmills below $3,000. 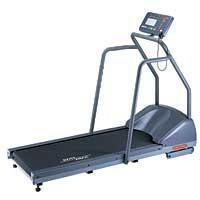 This treadmill is perfect for serious runners looking for a long lasting treadmill. If you’re someone who runs religiously, this treadmill would be perfect for your daily training. You’ll surely get the most out of your workouts with its numerous features. But of course, not everyone has a huge amount of money to spare on a treadmill. So if this equipment is beyond your budget, then I suggest you visit our best buy treadmills page and look for a treadmill that fits you best. The Star Trac TR901 treadmill comes with a 2.0 HP Continuous DC motor with a PWM Motor Control System which lessens current. It also puts less stress on electrical components and allows a smooth, accurate full speed range, especially at lower speeds. Its Impact Absorption System™ came from Star Trac's commercial product line to give you the best cushioning possible. It maximizes comfort and safety with dual-cavity, high density neoprene cushions along both sides of the deck to help protect your joints and ligaments. The 1" wax treated composite fiberboard running deck is reversible to double its life span. Both the Star Trac TR901 treadmill’s deck and belt are rated for 6,000 miles. The built-in Polar Heart Rate System allows for constant tracking of your heart rate. This feature would continuously monitor your heart rate and adjust elevation and/or speed to keep your heart rate at a desired training level during the Cardio Plus and Weight Loss programs. The workout data accumulates and automatically stores up to 5 users, and the Smart Console lets you create and save custom training programs. A number of new performance programs is also being provided... including the 5K and 10K race programs, progressive hill program, and a varied-profile program that generates 250 different workouts to help keep your workout fresh and exciting. The display panel shows your time, distance, speed, calories, laps, pace and heart rate. This information enables you to measure your progress during exercise so you can meet and exceed your previous workout. The Star Trac TR901 treadmill also comes with a 2 minute cool down feature, which is usually found only in commercial treadmills. It gradually adjusts speed and incline to a complete halt for a proper finish. And finally, it offers 3 years warranty for both its parts and labor (residential use). I believe that for a treadmill with nearly a $3,000 price tag, its motor lacks the power. With a bigger motor and probably longer warranties, this treadmill would definitely be on top of its price range. I would still recommend the Star Trac TR901 treadmill despite its flaws. I believe that it’s a well built treadmill packed with lots of features and the fallbacks are only minimal. Belt Size: 19" x 53"
If you plan on buying a Star Trac TR901 treadmill, I suggest you buy it at Amazon. You can get it for just $2,575.00.